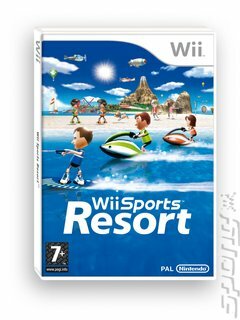 Wii Sports Resort is the follow up to Wii Sports: the hugely popular game from Nintendo that came bundled in with your Wii. Set on a tropical island, the emphasis this time is on a whole range of exciting new sports. The game makes use of (and comes packed with) the Wii MotionPlus controller, an add on that snaps onto the Wii Remote and increases sensitivity and accuracy of the Wii's motion detection to make games even more exciting and immersive. As well as including old favourites such as Golf and Bowling, both now enhanced to support Wii MotionPlus, Wii Sports Resort also introduces a whole array of exciting new sports. There's Wakeboarding, Archery, Sword Play, Jetskiing (called Power Cruising in the game) and Basketball. There's also the game of Disc Dog, which involves throwing a Frisbee flying disc to a cute Mii-like dog, in which accuracy is the order of the day to give the poor pooch a fighting chance of catching the thing. Just as with Wii Sports, players will be able to compete against up to three friends or family members. And just like the first game, getting started with Wii Sports Resort is so straightforward that new players will find it easy to pick up a Wii Remote and jump into the action. But beware - becoming the best player will be fiendishly frustrating and incredibly addictive.